Urban Solar Garden Energy Production Dashboard | EnergySaveNewWest | Save Energy, Save Money. Energy Save New West is pleased to announce the launch of the Urban Solar Garden’s energy production dashboard. 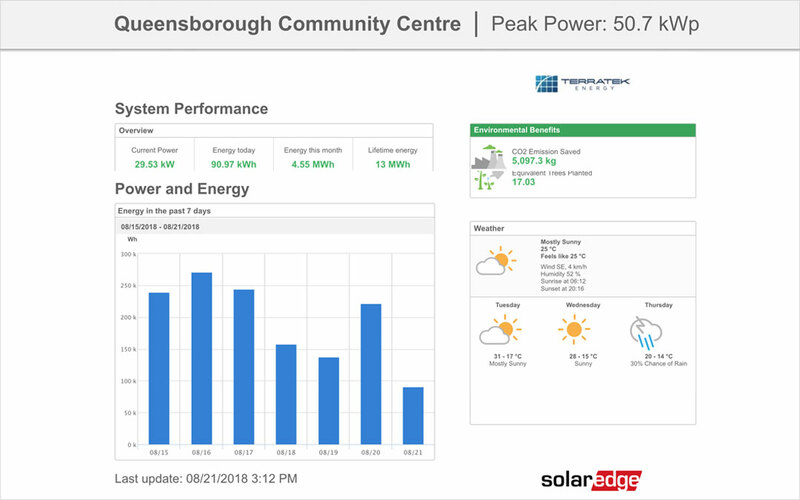 The dashboard provides a summary of electricity generated by the 50 kW solar array including daily and weekly production values. The purpose of the dashboard is to provide subscribers with an at a glimpse summary of overall system performance. Overview table highlighting current power and energy generated today, monthly and since solar array was commissioned. Energy production charts in daily and weekly formats. It is important to note, the energy production values presented on the dashboard are estimates only to track indicative panel performance. The electricity production data for energy credits will be calculated from the electric utility meter that was installed to monitor energy production from the Urban Solar Garden. Please stay tuned to Energy Save New West’s website and our program e-newsletter for periodic updates on the Urban Solar Garden. If you have any questions on the Urban Solar Garden, please do not hesitate to reach out and provide us your thoughts via email.